London’s impressive array of skyscrapers has grown significantly in recent years. To see just how much London’s skyline has changed, NLA’s Tall Building Report, released in March this year, reveals just how many towers have sprung up in 2016, and what is still in the pipeline moving forward. – 2016 was an impressive year for tall buildings, with 26 being completed, many more than any other survey year. We are set to see a further increase in the amount built over the next two years. – There are currently 455 tall buildings in the development pipeline. The majority of these new towers are residential, as the chart below shows. 30% of the new homes in London currently under construction are in such buildings. If the current predicted pipeline of residential buildings were to get the go ahead, this would give London an impressive 100,000 new homes. 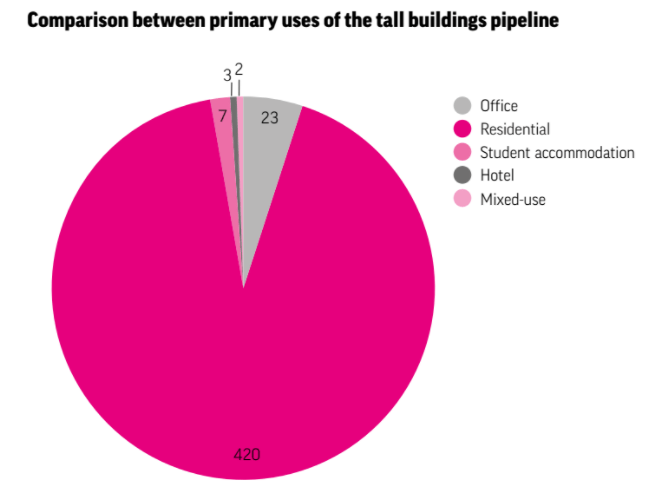 24 of London’s 33 boroughs have a tall building pipeline. But this is not to say the others have no pipeline at all, as they may be set for smaller buildings. The level of current construction activity for tall buildings has remained consistent this year (91 under construction compared to 89 last year). In terms of geographic allocation, the number of boroughs containing tall buildings under construction also remains almost constant. 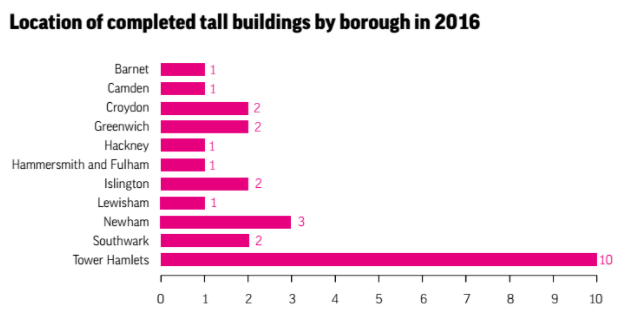 The borough experiencing the most growth of tall buildings under construction continues to be Tower Hamlets, with Lambeth, Newham and Greenwich also experiencing significant tall building construction activity. Although London clearly has the most mature market for tall building development in the UK, it will be interesting to see over the next few years if this demand for tall buildings continues through other cities throughout the UK.